Book of Mormon Central / Archive / Did Lehi Organize His Posterity into Seven Tribes? Did Lehi Organize His Posterity into Seven Tribes? Title Did Lehi Organize His Posterity into Seven Tribes? Before his death, Lehi gave blessings and counsel to his posterity (see 2 Nephi 4:1–11). 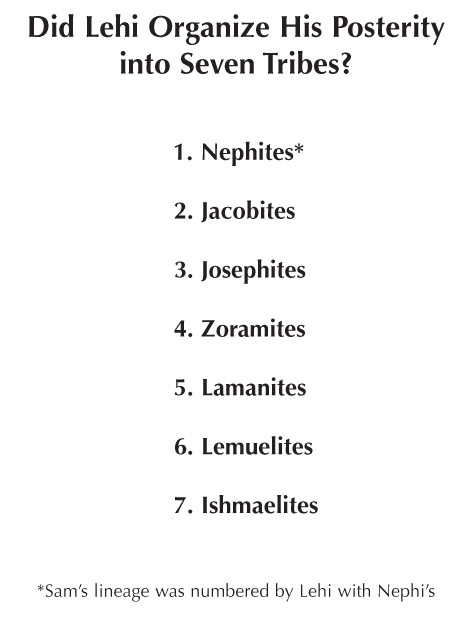 At this time, he may have organized them into seven tribes: Nephites, Jacobites, Josephites, Zoramites, Lamanites, Lemuelites, and Ishmaelites (see Jacob 1:13; 4 Nephi 1:38; Mormon 1:8). While Nephite and Lamanite governments came and went, the tribal structure of their society endured, suggesting that Lehi's children considered his organization of tribes binding and constitutional. The patriarch "father Lehi," as he is called by Enos, Benjamin, Alma, Helaman, Nephi, and Mormon, parallels Jacob/Israel in many respects, for both organized a people of God in a new land of promise by dividing their children into groups.